Poor old Meglos always seems to be the overlooked, under appreciated child of season eighteen. Sandwiched between the new-look relaunch story The Leisure Hive and the TARDIS crew-changing trilogy of the E-Space stories, its lack of any particular hook or event which makes it an important part of either the mythos of the show or the nature of its production means it tends to be rather forgotten about. Which is a great shame, and I hope its turn to be released on DVD sees it getting a little more recognition than it hitherto has. Although it does have some of the po-faced faux-science that runs through all of season eighteen (why not just call it a “Time Loop”, rather than a “Chronic Hysteresis”? ), it runs at a much faster pace and has a much more involving story than its immediate predecessor, with John Flanagan and Andrew McCulloch doing a good job of creating an interesting story of science versus religion with characters who you actually want to know what happens to them. Nowhere does their ability to create worthwhile characters come across more than the main villain, Meglos, who is possibly the most interesting villain to turn up anywhere in this season. His first appearance, as the random cactus with the disembodied voice, ought to seem utterly absurd and ridiculous, but somehow the vocal performance lends a genuine air of intellect and menace. 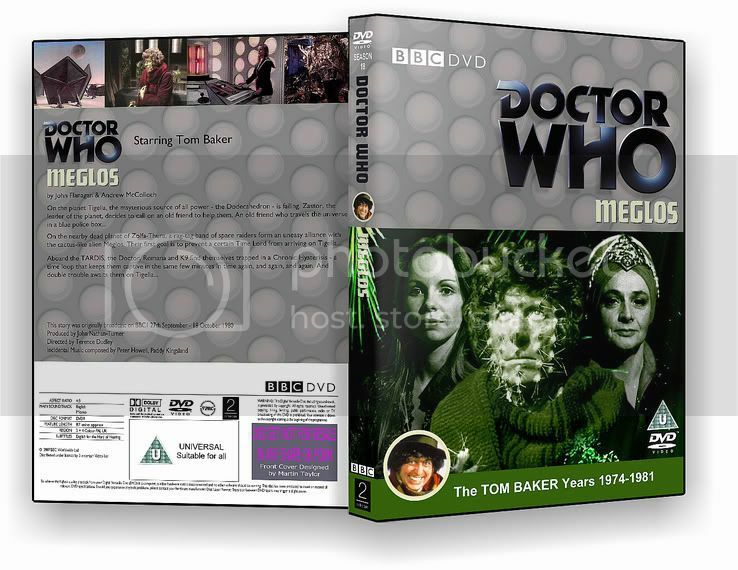 As the story moves along, Tom Baker’s performance as Meglos impersonating the Doctor also works well. Admittedly it does have to be said that Meglos impersonating the Doctor creates one of the weak points of the story, when the Tigellan scientists are so ready to accept that the Doctor has been impersonated, and to believe his story. It’s a shame that in a script where they generally do so well that Flanagan and McCulloch do lapse into some lazy writing every now and again – another case in point being Romana leading the Gaztaks, who hitherto been interesting and funny characters, round and round in circles through the forest like a bunch of space morons. And on another note, why didn’t they recognise her from their watching of the Chronic Hysteresis on Meglos’s screen, anyway...? Quibbles aside, the aforementioned forest is one of the better ones to have been attempted within the confines of a multi-camera studio on Doctor Who down the years. In fact, the whole of Meglos looks pretty damn good – Terence Dudley having perhaps his finest outing as a director on the programme. He’s able to get the infamous lighting levels down for some of the Gaztak spaceship and Deon worship scenes, and he’s lucky enough to have great support from make-up (the Meglos cactus facial make-up on Christopher Owen and Tom Baker) and the more technical departments (the excellent Scene-Sync work). There’s a very good guest cast been recruited, too – notably Bill Fraser, Frederick Treves and yes, even Jacqueline Hill coming back to a series that must have been so bamboozingly different from that little programme she left back in Lime Grove all those years ago. She’s let down by Lexa’s death scene, though – which is rushed, pointless and basically thrown away. If you’ve not seen Meglos before, or if you haven’t given it a look for some time, I’d recommend picking this up if you get the chance. You might be pleasantly surprised – it’s a reminder that even in its uncelebrated instalments, Doctor Who can provide more entertainment than an average piece of television. As always, we’re spoiled on Doctor Who, with even a “run of the mill” story such as Meglos receiving a bonus feature package which puts most feature films to shame. The commentary, which features Lalla Ward, John Flanagan, Christopher Owen and Paddy Kingsland, probably doesn’t contain anything startlingly insightful, but is amiable enough, and it’s interesting to note how on occasion Ward seems to slip into a moderator-type role, leading the discussion and asking questions of the others. My favourite of the bonus features was Meglos Men, an interesting way of looking at the writing of the story. Rather than simply being talking heads in a studio, Flanagan and McCulloch meet up and travel around some of their old London haunts in a very nicely-shot and interesting feature which even sees them pop round Christopher H. Bidmead’s house. I don’t think they’re writers who will be as familiar to most Who fans as some others who have worked on the series, so it’s worth a look to find out a bit more about the background to the writing of the serial. The Scene Sync Story is an interesting look at the technology behind the innovation which helped make the Zolfa-Thuran scenes of Meglos look so good, locking two cameras of a Chromakey shot together. I am very interested in this sort of behind the scenes, production history nitty-gritty, although I appreciate it’s not everyone’s cup of tea. The Jacqueline Hill documentary, A Life in Pictures, is very welcome, although I couldn’t help but feel it would have been nice for it to have been longer, and to have included some more clips of her work outside of Doctor Who. I appreciate that this probably would have involved clearance costs, though, and doubtless the money was better spent elsewhere on the release. I didn’t like Entropy Explained very much – this sort of ‘educational’ type feature may be an interesting idea for a different type of extra, but I just don’t think it works. It’s Doctor Who, after all, not real science, and exploring the real scientific concepts stories may sometimes play with probably only flags up how dodgy the science of the stories often is. Plus it doesn’t seem to be able to decide if it’s trying to be serious or funny, with the presentation style playing it straight, but the captions throwing in Hitch-Hiker’s Guide jokes and shampoo advert references. There are the usual goodies in terms of production note subtitles, a photo gallery and PDF materials to be had, too – all-in-all, the typical very high standard we’ve come to take for granted on the Doctor Who discs.